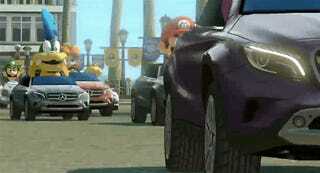 That weird Mercedes DLC for Mario Kart 8 is out at the end of the month. And yeah, it's not pretty. We initially thought there was going to be one real car made available for the game (for free, since this is sponsored content), but there are actually three. Which gives Nintendo/Mercedes enough cars to make a trailer. WARNING: sensitive readers are advised that the trailer below features scenes of a deeply distressing nature.